The mission of the NC AHEC Program is to meet North Carolina's health and health workforce needs. NC AHEC provides educational programs and services that bridge academic institutions and communities to improve the health of the people of North Carolina with a focus on underserved populations. The Wake Area Health Education Center (AHEC) is one of nine AHEC centers located throughout North Carolina and is affiliated with the North Carolina Area Health Education Centers Program at the University of North Carolina - Chapel Hill School of Medicine. 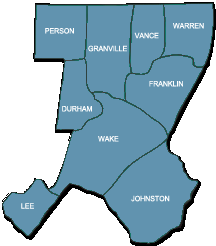 Wake AHEC provides services to health and human service providers in a nine-county region encompassing Durham, Franklin, Granville, Johnston, Lee, Person, Vance, Wake and Warren counties. Although these counties are the primary service region, health care professionals from any geographic area are welcome to participate in all educational programs, activities and services. There are four key areas to which educational programs and activities are targeted. Improving the distribution and retention of health care providers, with a special emphasis on primary care and prevention. Increasing the representation of minorities and disadvantaged populations in all health professions. Addressing the health care needs in underserved communities and populations.